You might not yet know the name Sidney de Vries, but I assure you he is fast becoming a big deal in the newly emerging gaming genre of .io games. 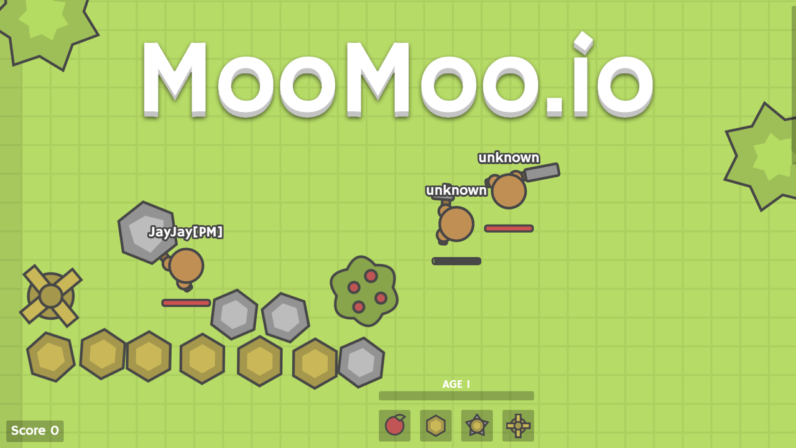 A few days ago he released the beta version of his latest game, moomoo.io. You can play it here. The basic idea of moomooio is to collect materials like food, wood and stone. You do this by attacking bushes, trees and rocks with your weapon. As you do so, your little character wields his axe and rewards you with an apple, for example. Once you have collected enough materials, you can start to build fortifications anywhere you like. Ideally, you place them in locations that block other players from attacking you while you harvest more goods. To gain points in the game you can do two things and herein lies the genius of the game. Firstly, you can attack other players, killing them rewards you with points. Secondly, you can fortify an area and build windmills. Over time the windmills give you points. As you can see, there are two paths here. One is designed for aggressive players that would rather fight or don’t have the patents to grind away. The other is tailored to more passive players that would rather build a fort and ward off intruders as they harvest points with windmills. Obviously, there will be players that see the benefits of securing an area and using windmills, whilst they kill other players, thus maximising their point earning. Will Moomoo.io be the Next Big IO Game? Moomoo.io or Moomooio as is will surely be called, feels unique in the way it merges concepts from a few other games in its genre. For example, the notion of collecting resources to further your position in the game, is the basic idea behind the hit game Mope.io. Also, Diep.io set the precedence for upgrading your character and it feels as though moomooio is not only building on that, it is, as I said before, merging various concepts very uniquely. The result of which is very captivating and feels like it has a lot of room to grow and expand. Sidney could easily add new characters, weapons, defences, resources and anything else he can think of. The possibilities for his game are limitless and as we have seen with Mope.io, the users love updates. They really seem to fuel the gaming community and keep the games alive. Nevertheless, gaming is a fickle market and the game’s lifespan will ultimately rest on the whim of the people playing. Read next: Sharing things that actually help!